Kheirabadi BS et Al. J Trauma Acute Care Surg. 2017 Apr 18. doi: 10.1097/TA.0000000000001501. Un travail très pratique qui fait le point sur la performance des pansements 3 côtés non occlusifs. Plusieurs sont disponibles sur le marché. Mais qu'en est il des divers dispositifs proposés sur le marché. On dispose déjà de données concernant les propriétés "adhésives" de ces dispositifs (1). Avec ce travail, on a en plus une idée sur la capacité de ces pansements à permettre l'écoulement de saignement intra-thoraciques. L'historique valve d'asherman doit être considérée comme obsolète. Hemopneumothorax (HPTX) is the second leading cause of potentially preventable death among combat casualties. We investigated the ability of five FDA-approved non-occlusive chest seals (CSs) to seal a bleeding chest wound and prevent tension HPTX in a swine model. Following instrumentation, an open chest wound was created in the left thorax of spontaneously air-breathing anesthetized pigs (n=26, 43 Kg). Autologous fresh blood (226 mL) was then infused into the pleural cavity to produce HPTX. The chest wounds were then sealed with CSs. The sealant strength and venting function of CSs were challenged by infusion of 50 mL more blood directly into the chest wound and incremental air injections into the pleural cavity. 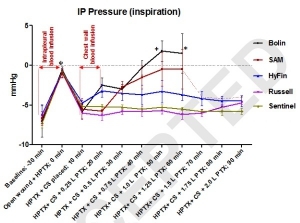 Tension HPTX was defined as intrapleural (IP) pressure ≥ +1 mmHg and >20% deviation in physiological measurements. An open chest wound with HPTX raised IP pressure (~ -0.7 mmHg) and caused labored breathing and reductions in PaO2 and SvO2 (P<0.01). Sealing the wounds with the CSs restored IP pressure, and improved breathing and oxygenation. Subsequent blood infusion into the wound and IP air injections produced CS-dependent responses. CSs with one-way valves (Bolin and SAM) did not evacuate the blood efficiently; pooled blood either detached the CSs from skin and leaked out (75%), or clotted and clogged the valve and led to tension HPTX (25%). Conversely, CSs with laminar venting channels allowed escape of blood and air from the pleural cavity and maintained IP pressure and oxygenation near normal levels. Success rates were 100% for Sentinel and Russell (6/6); 67% for HyFin (4/6); 25% for SAM (1/4); and 0% for Bolin (0/4) CSs (p=0.002). The sealant and valve function of vented CS differed widely in the presence of bleeding chest wounds. Medics should be equipped with more effective CSs for treating HPTX in the field.